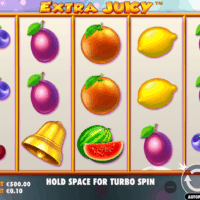 Pragmatic Play, has unveiled its fruitiest slot yet, Extra Juicy. The 3×5, 10-line video slot features classic fruit symbols, diamonds and bells. Players can win left to right, starting from any reel. Hidden Diamonds await on the first, third and fifth reels to trigger a progressive multiplier free spins round, which sees players start with 12 free spins and the win multiplier increase by 1x every spin. Scatter symbols can retrigger the feature up to four times, giving players the chance to win up to 60x their original stake. Extra Juicy is the latest addition to Pragmatic Play’s popular offering and follows the launch of Wild Gladiators, as well as complementing best-performing titles Wolf Gold, Da Vinci’s Treasure and Mustang Gold.